until it's gone... on your Mac! 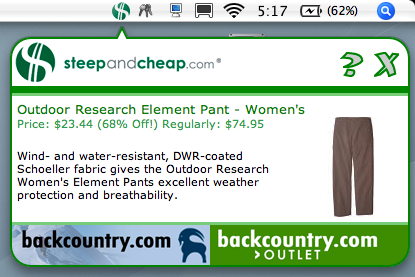 Bring the discounts on SteepAndCheap.com to your Mac desktop! 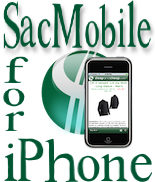 Sac4Mac is a status menu item which alerts you as soon as the latest deal is posted to SteepAndCheap. A popup window is shown for a few seconds, so you can snag great gear on the cheap without interrupting your workflow. You can also configure it to only show products for women or men, set a custom alert sound, and have it automatically start up when you log in! Note: Sac4Mac is currently beta software. We appreciate your interest, and we would love to hear your feedback! Copyright 2009, The Obvious Gap, Inc.